Behind every altruistic effort or illuminating project is an organization working around the clock for the betterment of their community. Each month we will place a spotlight on organizations across the Chicagoland area that are invested in creating opportunities and elevating their community. This month we focus our attention on Friends of the Parks. Deputy Director of Program and Resource Development Sandra Del Toro shares the mission of Friends of the Parks and how you can get involved. Lawndale Bilingual News: In your own words, describe the mission of Friends of the Parks? Sandra Del Toro: Friends of the Parks’ mission is about the active engagement of Chicago residents with their parks to ensure equity in parks for the health of our communities across Chicago. After our recently-completed strategic planning process, we launched a new mission statement: Friends of the Parks inspires, equips, and mobilizes a diverse Chicago to ensure an equitable park system for a healthy Chicago. How does Friends of the Parks engage with the community? Friends of the Parks engages with communities in a number of ways. 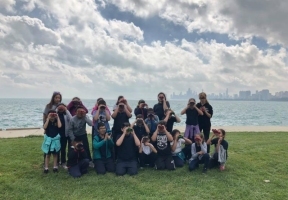 Our education program work with youth and young adults across a number of schools in Chicago to appreciate the wonder of open spaces including Lake Michigan. We regularly take elementary school aged children, their parents, and teachers to the lakefront as well as engage them in open spaces in other parts of the city. We also lead the oldest and largest Earth Day celebration across the city engaging people in the care of their parks. We work with local residents to build park advisory councils and park partner organizations and equip them with tools to be more effective stewards of their resources and effective park advocates. Finally, we seek to engage all of Chicago in being the best advocates for our parks to ensure a healthy Chicago. What goals are set forth for Friends of the Parks in the new year? Coming off of our recently completed “State of the Parks” report, we will work with communities to urge the new mayoral and Chicago Park District leadership to apply an equity framework to their park planning to make progress toward more equitable distribution of resources across the Chicago Park District. To this end, we want to ensure neighborhoods most in need of new amenities and parkland are able to get them. Friends of the Parks will continue to work on its high priority signature advocacy projects, including ensuring that the Obama Foundation commits to paying for the replacement of park resources displaced by the Obama Presidential Center. We will continue to urge the next mayor to ensure that a deal gets done for the former US Steel mill redevelopment on Chicago’s southeast side that provides jobs, affordable housing, and parks that are safe, accessible to neighbors, and well-maintained. For someone interested in volunteering, what opportunities are available to them? Volunteers are the lifeblood of our organization. We regularly work with volunteer groups in hosting Earth Day to engage people in caring for their parks on that day and throughout the year. 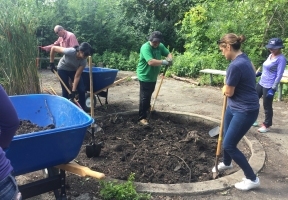 People can volunteer to put a group together to form a park advisory council or other formal group to lead community projects, advocate for their open spaces, and take ownership of their local park. Friends of the Parks also has a need for volunteers in our office who want to take advantage of an ongoing or one-time volunteer opportunity. What would you like the community to know about Friends of the Parks? Friends of the Parks has a core belief that parks are public places for recreation, contemplation, and gathering that should be accessible to all and equitably resourced. Friends of the Parks’ vision has always been and will continue to reflect those values.